India, Noida – War has been a constant threat to mankind, especially the young generations who were and are forced to become involved in armed disputes. Along with many NGOs, charitable organizations, and individuals educating people to protect the lives of youth, Heavenly Culture, World Peace, Restoration of Light (HWPL) is at the forefront of preventing and ceasing conflicts through its various peace initiatives. These initiatives include implementing peace education courses throughout the world. Its valuable efforts are essential to the security of mankind and future peace. A peace advocate and international peace lecturer, Chairman Man Hee Lee of HWPL, has conducted many peace agreements to solve political and religious conflicts as well as educated youths through a practical program of peace education. Ramagya School, one of the top ten educational institutes in the city of Noida, India, was designated as a HWPL Peace Academy on December 21st. The school announced to integrate peace education into their curriculum by establishing the HWPL Peace Education Courses. The school also appointed Chairman Lee as a honorary Chairman of the Advisory Board and Chairwoman of the International Women’s Peace Group (IWPG) as a honorary Chairwoman of the Advisory Board. 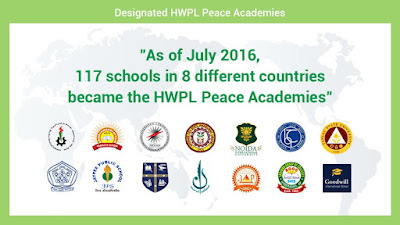 Notably, along with Ramagya School, four other well-known schools in the region - Samsara School, Jaypee School, Ahlcon Public School, and Noida International University- were designated as HWPL Peace Academies. Chairwoman of chairwomen said, “I firmly believe that the non-violence movement started by Gandhi can be fulfilled through the HWPL peace initiatives. As the Ramagya School became a Peace Academy, we will support and educate students to become the leading figures not only in India but also throughout the world. I sincerely congratulate you.” This innovative approach to teach students the practical steps of peace through peace education is catching on and being adopted by many prestigious institutions. Mr. Sanjay Gupta, Chairman of Ramagya School and President of Purusharth Charitable Society, recalled his meeting with Chairman Lee exactly a year ago and eagerly contributed to implementing the peace course. The two Chairpersons discussed to design programs and courses to enhance the peacemaking capacities of the students and highlight HWPL’s most recent peacemaking efforts. HWPL is in the process of developing a comprehensive peace program which provides an educational framework for conflict analysis and resolution, interfaith peace dialogue sessions, and explains how they were able to build alliances between religions through their World Alliance of Religions Peace (WARP) Offices. Recognizing the efforts of the HWPL Peace Delegation in many parts of the world and celebrating the designation ceremony, the school also unveiled the Monument to commemorate the Declaration of World Peace. The Declaration was presented by Chairman Lee in 2013 on behalf of women and youth of the world at the Peace Gate in Seoul. The Monument is now an emblem of world peace in Noida. With the grace and life we have received – are we entitled to fight, kill and destroy one another? We cannot claim to desire peace and continue to provoke one another, causing conflict for the sake of valuing our own national interests above those of others. This is not a legacy we can leave to future generations ... Of what use is a young life, born in our day and age, if it is thrown away without having had a chance to bloom? What price can compensate for the loss of a life? … We call on the heads of state of every country to sign an international agreement – a commitment to bringing all wars to an end. … The only way to stop the fighting and pointless tragic deaths is to stop fighting.